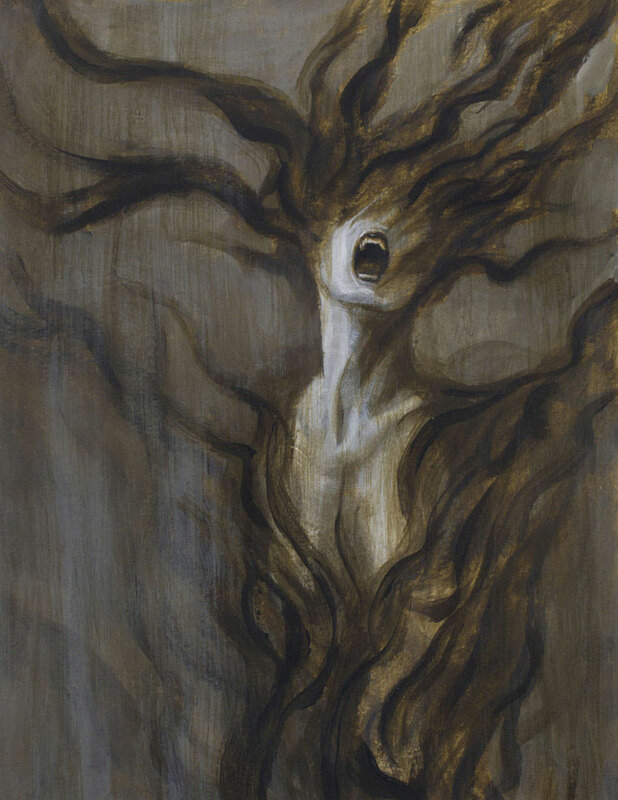 Furies (Erinyes) in Greek mythology are mythical chthonic deities that chased those who had committed crimes against the physical and moral order of things. According to Hesiod, the Furies were born from Titan Uranus' blood that dripped when his son, Cronus, castrated him. According to other authors, Hades and Persephone were considered Furies’ parents, whereas Aeschylus believed they were the daughters of Night and Sophocles that they were the daughters of Earth and Darkness. The Furies (Erinyes) were winged demons chasing their prey flying. They had similar proportions with the other infernal and chthonic deities like Keres and Harpies. They had the ability to transform quickly and often. Their black skin was covered by black dresses. Their faces were frightening and horrific and they had snakes for hair like Medusa (Gorgon). Furies' breath was poisonous as was also the foam coming out of their mouths. They breathed flames and sparks were coming out of their eyes. Furies were spreading all sorts of illnesses and were preventing even plants from growing. One of the most important duties of the Furies was to stalk offenders, especially all those who had not fulfilled their obligations dictated by family affection. That is, the care and love of parents towards their children as well as vice versa. In addition, the Furies punished and persecuted vengefully all those who had committed murder, were obsessed with hatred and malice, committed perjury or were deceitful. They also punished all acts that were contrary to the natural order and harmony of the world. Furies were going so far as to punish even those who grabbed the chicks from the birds' nests. We can say that, through the Furies, the ancient Greeks were symbolizing the remorse and guilt that filled the soul and mind of an injustice, an evil or a criminal and that lead to their destruction, proving that the eye of divine justice sees everything and doling everyone rightly with the remuneration they deserve. None culprit is saved from their abysmal revenge, even though he may believe that he is safe. All of a sudden, the terrifying Furies lass out towards him, not leaving him in peace, plundering his house, kicking him out of there and pursuing him, until he drops weary and crazy from the songs that constantly ring to his ears. Euripides says Furies were three: Alecto (anthropomorphism of rage and mania), Tisiphone (anthropomorphism of revenge to killings) and Megaera (anthropomorphism of hatred and envy). Alecto is the Fury that delivers the punishment of moral crimes (such as anger), especially if directed against other people. The power is similar to Nemesis, except that the power of the latter is to punish crimes against the gods. 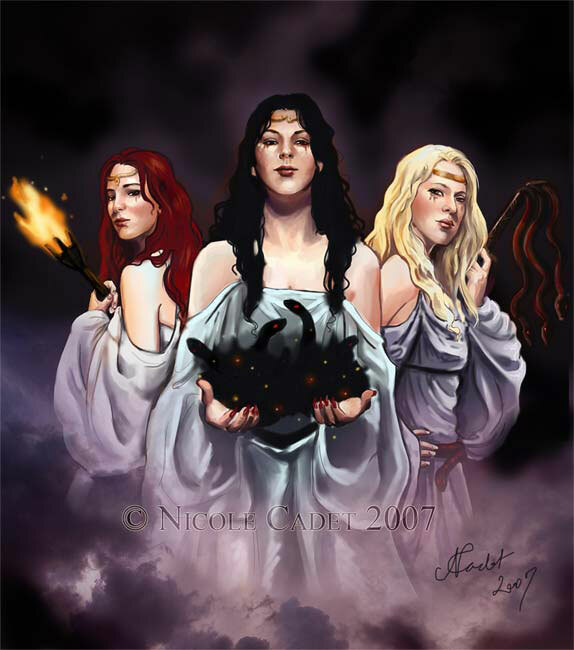 Alecto is referred to Aeneid of Virgil and in Dante's Divine Comedy (Inferno) as one of the three Furies. In Greek mythology, Megaera (not to be confused with Megara) is specifically associated with jealousy and envy (the etymology of the word) and punished especially the marital infidelity. In modern times, the word "Megaera" came to mean any sinister and unrelenting woman, both in Modern Greek, as also in other languages: In modern French (mégère) and Portuguese (megera), the word suggests a revolting and envious woman, while the Italian word megera means a bad and ugly woman. 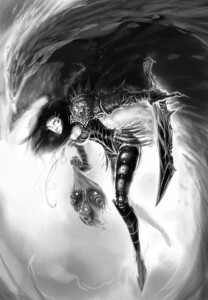 The Fury Tisiphone, as implied by her name, is believed that was acting as a punisher of the murderers. In the Aeneid of Virgil, Tisiphone is a truculent and tough guard of Tartarus’ gates. In Homer's Iliad, we see the god Ares (Mars) pursued by the Furies because he helped the Trojans, against the wishes of his mother Hera. A similar threat was hanging over Telemachus if he chose to drive Penelope away from the family home. The mother of Meleager invokes the Furies against her son, who had killed her brothers. Furies, being vigilantes of the most horrible of all crimes, patricide, served as inspiration to Greek tragedians, especially in the myths of Orestes and Oedipus. The misfortunes of Oedipus come from the fact that, unintentionally, had been found guilty towards his parents. In the third tragedy of Aeschylus' Oresteia trilogy, Furies persecute Orestes, son of Agamemnon and Clytemnestra for the murder of his mother. In another legend, Megaera, lashed so much the women of ancient Nysa until they gone mad and killed their own children. At the same time, the infernal deities can also lose the character of merciless and brutal deities. When people are held in reverence by the laws of ethics, it is when the Furies are transformed into Eumenides, beneficial deities, considered protectors of foreign visitors and beggars. Eumenides also removed from a man or a country, the destruction, disease, danger, drought, harmful winds and bring the euphoria, health and prosperity. I love Greek mythology, and the other day, I was assigned an essay to research the Erinyes. Luckily, I landed at this site; it does not disappoint.The information is very reliable (I cross-reference everything I put into my papers), and frankly, it’s entertaining as heck! Thank you for this quality article! Very excellent! I’ve been re-reading a lot of the old greek myths, all the great art is a really nice flourish! It is good to consider the Furies today as well, and to be sure to avoid falling under their auspices!